Bigger, bolder and brighter than the white-hot lights of 1940s Hollywood, Marvel’s Agent Carter blazes back for a second season packed with action, humour and intrigue! In the wake of World War II, top SSR (Strategic Scientific Reserve) agent Peggy Carter (Hayley Atwell) is dedicated to stopping new, Atomic Age threats. Blessed with brains, beauty and formidable fighting skills, Peggy trades the lampposts of New York City for the palm trees of Los Angeles to crack a baffling case with her partner in crime-fighting, Edwin Jarvis (James D’Arcy): A body has just been discovered in a frozen lake…during a heatwave. When this bizarre phenomenon is traced to Isodyne Energy, the mystery deepens, exposing a shocking conspiracy and the revelation of a substance that could end life as we know it—once it falls into the hands of actress-turned-mad-scientist Whitney Frost. With the fate of humanity at stake, Peggy must defeat Whitney, face off again with archnemesis Dottie Underwood and navigate a love triangle involving potential new romance Dr. Jason Wilkes and smouldering old flame Chief Daniel Sousa. 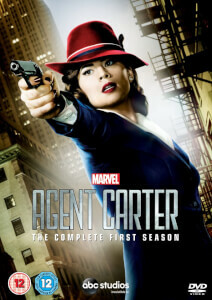 Experience all the adventure and pulse-pounding suspense with Marvel’s Agent Carter: The Complete Second Season.